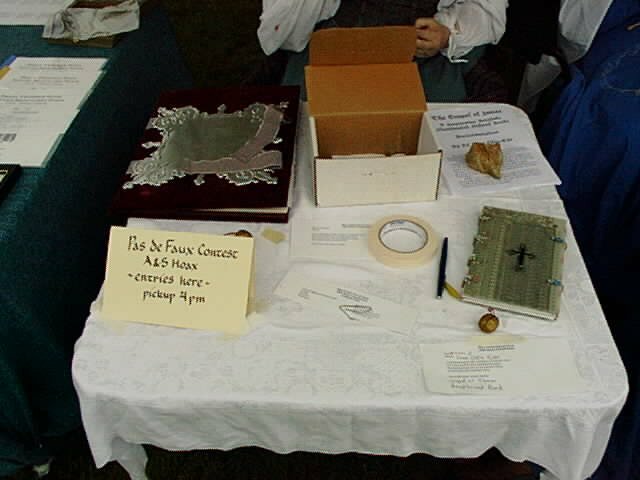 A contest designed to allow artisans to stretch themselves into unlikely and impossible "period" artifacts and document them in a spurious way. How does one take a picture of a performance? Ok, I staged these pictures, but what else would you do for a joke contest? 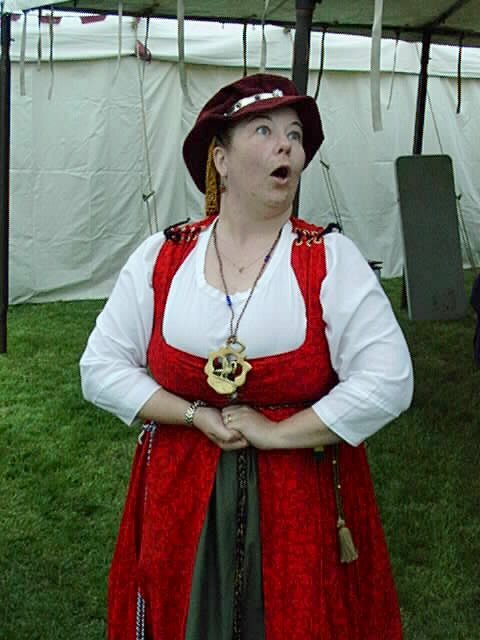 Mistress Arwyn entered a genuine personal composition of a period song. 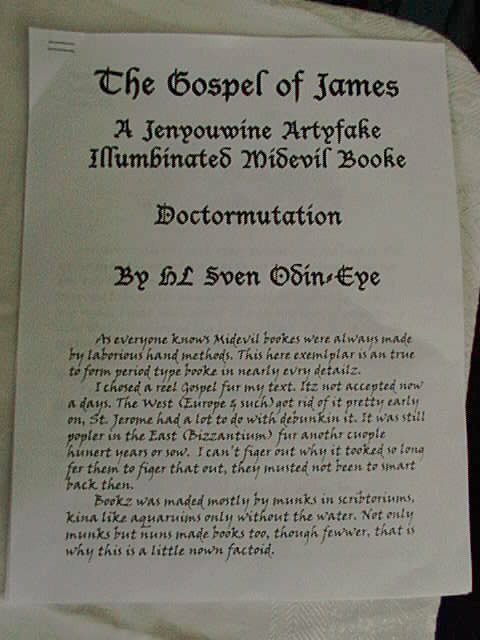 This is the front cover of the amazing Gospel of James, put together by THL Sven Odin Eye. 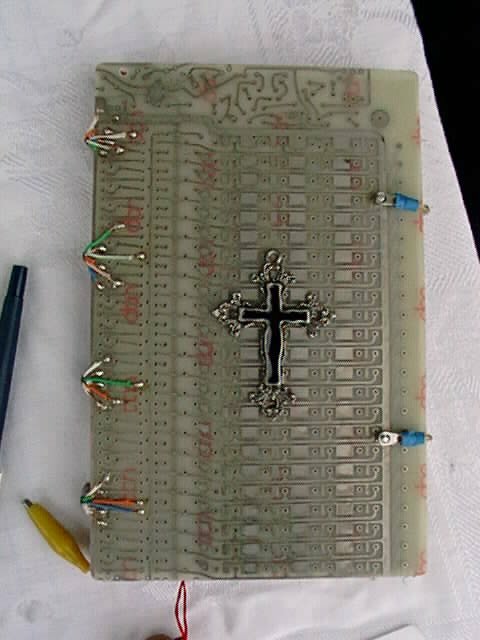 Yes that really is a circuit board, and those are soldered telephone wires. This is a representative sample page of the *many* pages in this book! 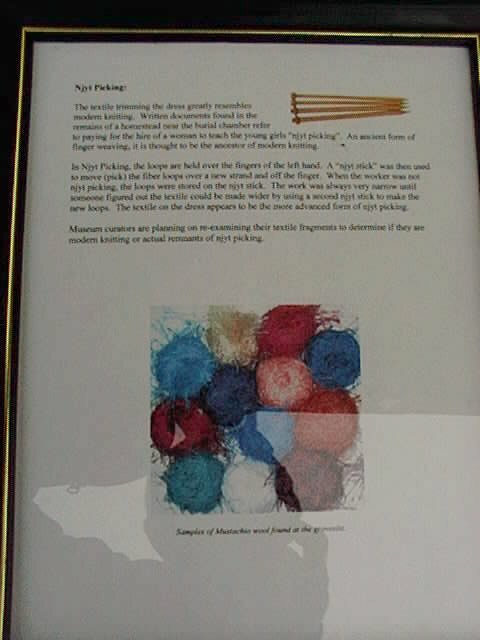 A second sample page. You really need to see this thing to believe it. 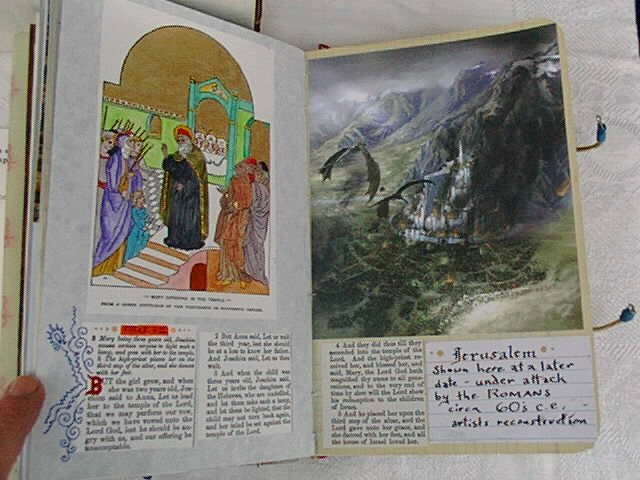 Here is the doctormutation that Sven came up with to prove the truth and beauty of his gospel. Or would that be truth and taking liberties? 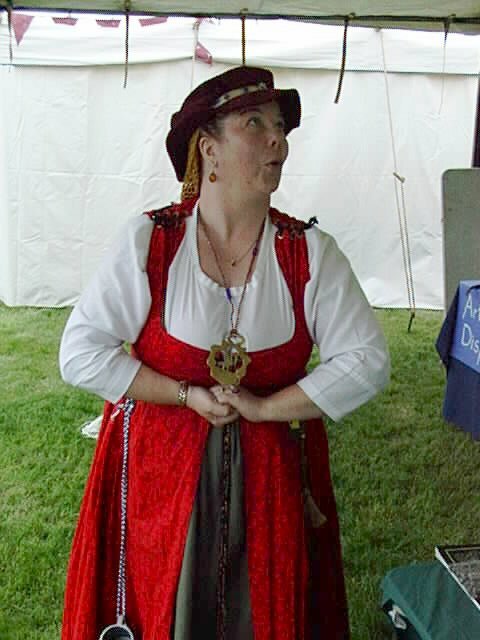 A lovely picture of a finished dress with actual njit picked trim from the frilly wool. 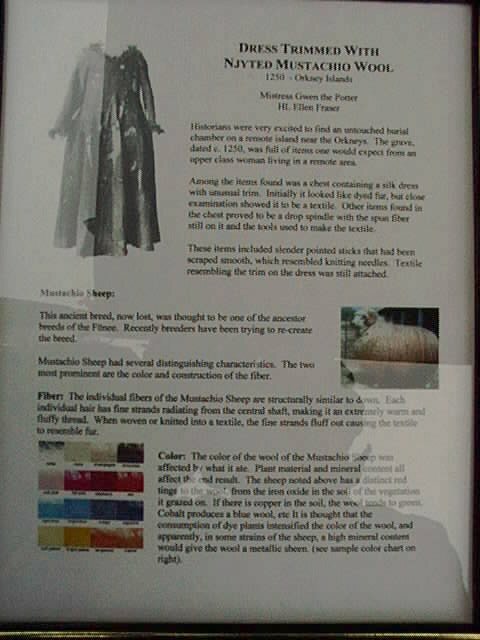 Documentation sheets for a special kind of sheep called the Mustachio, which grows different colored wool depending on its diet and climate conditions. This wool is also frilly and similar in texture to the fun fashion yarn available that is so popular right now for making scarves. 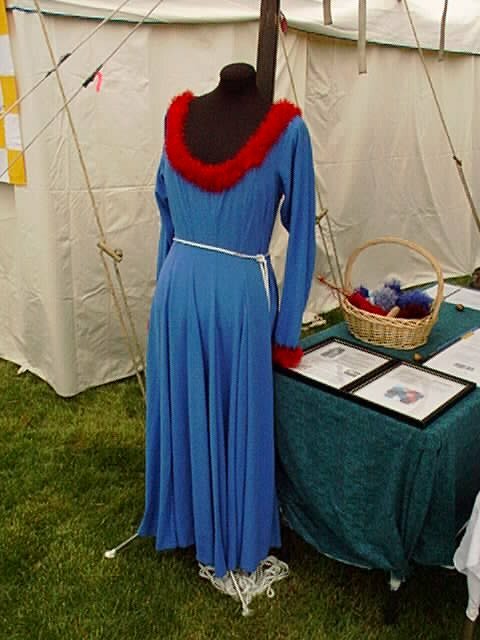 The ladies who came up with this wonderful entry, also did much "research" and rediscovered "Njit Picking" a precurser to knitting where you use your fingers and one knitting needle, called a Njit picker, to make a nice trim to use on dresses like that stunning "greenland dress" above. 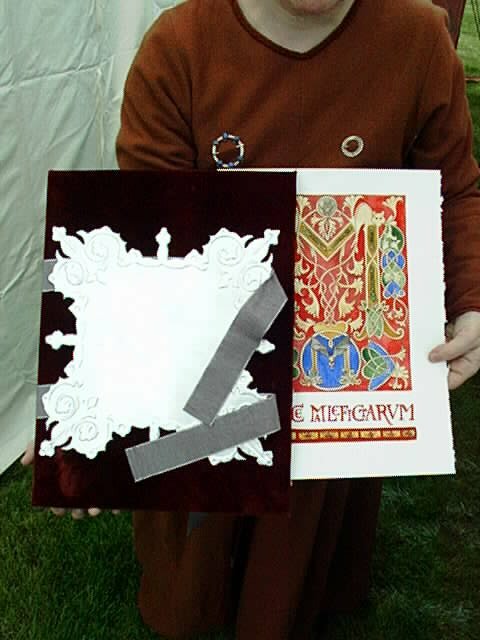 A lovely iluminated copy of the Malice Malefictarum. If you look on the table top shot below you can see that the front cover is embossed metal. Very beautiful. 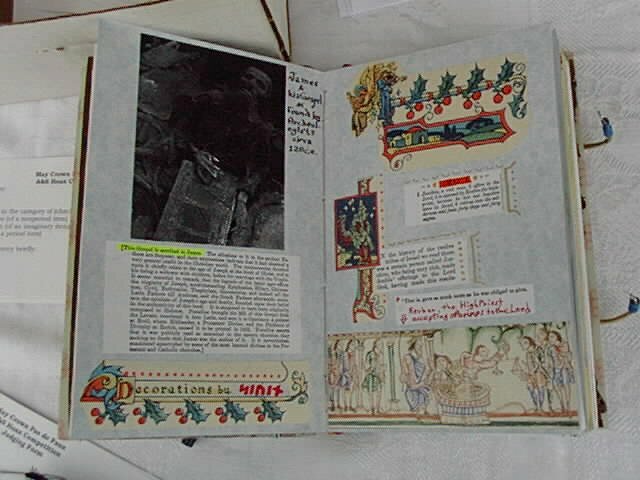 Inside, I didn't get any pictures, but it is 10+ pages calligraphed and illuminated. As you can see, we spared no expense on decorations and setup.